BALTIMORE - July 1, 2016 - PRLog -- Barcoding, Inc. (http://www.barcoding.com), a leader in supply chain efficiency, accuracy, and connectivity, has been selected to SupplyChainBrain's 100 Great Supply Chain Partners list. Honorees were selected based on results from a six-month online poll in which supply chain professionals nominated vendors and service providers whose solutions have made a significant impact on their company's efficiency, customer service and overall supply chain performance. 2016 marks Barcoding's second time receiving this award. Barcoding's inclusion on the Great Supply Chain Partners list stems from the company's consistent delivery of end-to-end supply chain solutions - from software applications and mobile devices, to automated data capture technology (barcodes and RFID), to professional services and support - that help clients become more efficient, accurate, and connected. Barcoding clients across industries regularly report significant time and cost savings, as well as the ability to improve their own customer service. Shane Snyder, president, Barcoding, Inc., said, "Whether we are implementing an RFID asset tracking system, performing an operational assessment or developing a customized mobile app, Barcoding takes the time to guide clients through each step of the process to ensure they receive a solution that meets their specific needs. Our selection to SupplyChainBrain's Great Supply Chain Partners list demonstrates the impact of this customer-centric approach on our clients' repeated successes." Each year, SupplyChainBrain receives hundreds of nominations from solution providers in every aspect of supply chain management. The publication compiles a list of 100 Great Supply Chain Partners that features a select group of companies whose customers recognize them for providing outstanding solutions and services. 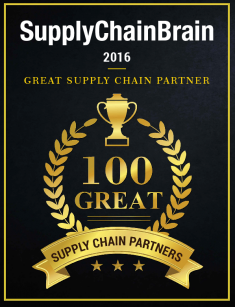 Barcoding will appear in the July/August 2016 issue of SupplyChainBrain as a celebrated member of this year's 100 Great Supply Chain Partners. SupplyChainBrain, the world's most comprehensive supply chain management information resource, is accessed year round through a wide range of ever evolving multi-media formats by hundreds of thousands of senior level industry executives. In addition to addressing the fundamental principles of supply-chain management, SupplyChainBrain identifies emerging trends, technologies and best practices, forward thinking ideas and cutting-edge solutions ~ and continues to write and report about these as they evolve and mature. Barcoding, Inc. is a systems integrator specializing in the development, deployment, and management of enterprise-wide solutions that drive efficiency, accuracy, and connectivity. With dedicated practices in Supply Chain Architecture, Automatic Identification (AIDC), Radio Frequency Identification (RFID), Consumables, Software, and Professionals Services, Barcoding impacts tens of thousands of organizations in a wide range of industries by increasing revenue, reducing operational costs, and improving customer experiences. Founded in 1998, Barcoding is headquartered in Baltimore, Maryland, with offices across the United States. For more information, visit us http://www.barcoding.com.